Hi, now that I've read through a few years worth of posts over the last month or so I thought I'd better say hello. 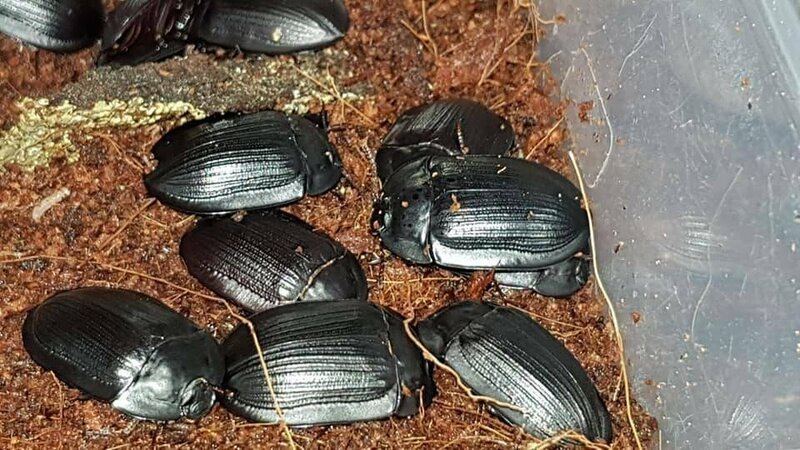 I live in South Australia and apart from mealworm colonies I haven't really kept beetles as pets since I was a kid, although I have always had a wide range of pets. 5 years or so ago I started keeping scorpions and centipedes, at the start of last year I added tarantulas to the list. Around the time I started keeping scorpions I moved my wood cockroach colony into a natural type set-up which I enjoy much more than the oats and egg carton style of keeping. This makes me want to set up some naturalistic enclosures for beetles. On the weekend I ordered some Pie-Dish Beetles which will arrive tomorrow. At this stage I haven't made a real attempt at a positive I.D. but here's the sellers photograph from his advert, I ordered 8, I'm hoping I can breed them in the enclosure without having to interfere. Interesting looking beetles! My bro lived in Terrigal, just north of Sydney for some years. Nice place. Coincidentally, these beetles would have been collected just north of Sydney, at least that's where my friend lives and he collected them himself. I live in South Australia in a high rainfall area atm, but I will be moving to an arid area on the banks of the Murray River in the next few weeks, I've seen some very interesting beetles when holidaying so I will be on the lookout! NIIIIIIICE, those are either a Helea species, or something very closely related... They are indeed called Piedish beetles over in Australia, and are similar in appearance to the US Piedish beetles, Embaphion spp, (and both are Tenebrionids). They likely have similar care to Embaphion, I wrote a caresheet for that genus here if you are interested, (most desert dwelling Tenebs can be cared for in the same manner).